A new tower is being constructed in the heart of the historical Box Hill precinct. A new tower is being constructed in the heart of the historical Box Hill precinct. Desyne Developments and the Peddle Thorp Group have partnered up with Grand Land developments to create a stunning monument of premium style and design. 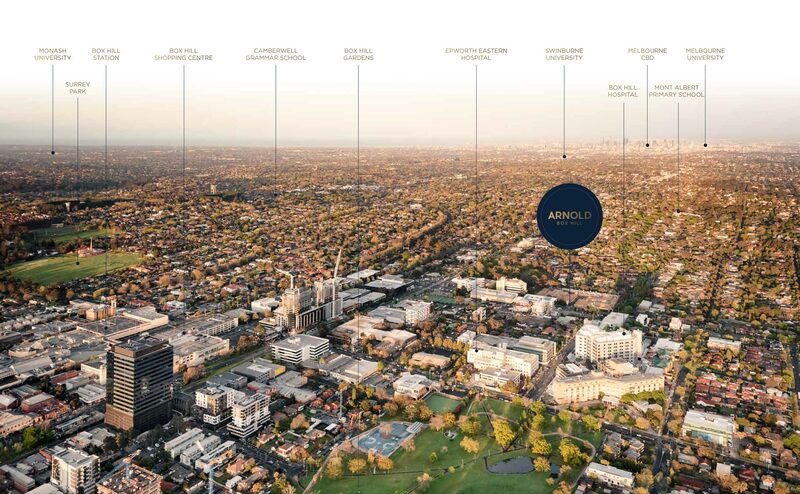 Set to be one of the highest buildings in Melbourne’s east, Arnold will command far-reaching views of the Dandenong ranges to the west, with the CBD skyline to the east. 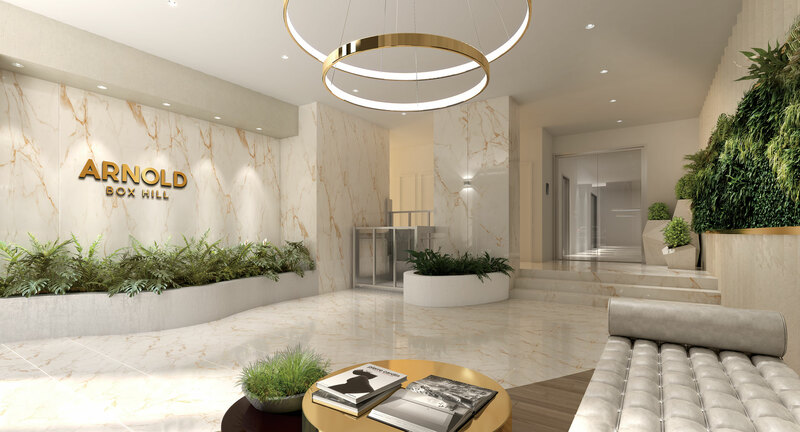 Comprising of one, two and three bedroom apartments, these residences bring a new level of style and design to leafy suburbia where Arnold is the embodiment of comfort, convenience, and connection. Buyers can choose between two palettes: lighter and darker, both carefully created and curated by leaders in interior design. Relax and unwind in modern elegance. Walk through entrances featuring floor to ceiling windows that overlook natural parks and gardens. Take security-tag enabled elevators to the rooftop and sit in the terraced garden to watch transcendent sunsets paint the city with pinks and purples. When the sun has set, prepare gourmet feasts in your apartment’s kitchen, outfitted with modern Borsch amenities that ensure entertaining is elegantly simple. Sprawl on a couch in the living area, softly lit by the night sky glowing through generous windows. Open one of the many smart storage drawers for a book, tuck a merino wool throw around your legs and settle in for the night. Exhausted after a day’s work? Grab your keys and make your way to Carrington Road, the area’s very own Chinatown. Reminiscent of colourful Hong Kong, Carrington Road is flowing with fine restaurants, Canto-style cafes and specialist shops. At Box Hill Central, you will find Asian markets displaying intricate and rare ingredients that are hard to find in other areas of Melbourne. Box Hill is fast becoming Melbourne’s Second CBD. Jeff Green, Whitehorse city development manager, has said Plan Melbourne (the state Government metropolitan planning strategy) identified the premium suburb as one of two Metropolitan Activity Centres in the Eastern suburbs. As a result, this locale has become a hive of community living with many recreational and retail opportunities abounding. Residents of Arnold can join Aqualink for fitness and swimming pursuits, shop at any of the boutique designer stores in the major shopping centre or go for unlimited walks in the surrounding parks and gardens. Arnold is situated in close proximity to Box Hill Hospital. Several nurses have already bought residences, capitalising on the convenience of living in stylish luxury while being minutes away from work. Don’t miss out on these modern and elegant residential homes in idyllic Box Hill, Melbourne’s up-and-coming second CBD. Arnold will be launching this Sat & Sun from 10am-4pm. To find out more about Arnold Box Hill, enquire today.